With the start of the New Year, there is always a lot of talk about diets, losing weight, and cutting calories. Eating healthy is not about deprivation, however, so I decided to feature a cookie recipe for this week's Recipe Makeover! 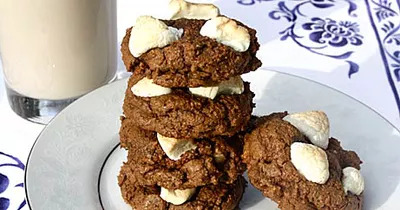 Using this classic Mississippi Mud Cookie recipe, I made a few simple swaps resulting in an easy, guilt-free indulgence that is sure to fit any healthy-eating routine! Filled with antioxidants, including dark chocolate and fiber from whole-grain flour, these cookies can make a great afternoon snack—perfect for satisfying that sweet tooth while also filling you up! The substitutions yielded a great cookie! Dense and hearty from the whole-grain flour with a great fudge taste from the dark chocolate morsels. Certainly an indulgence worth having!